Nike has long been obsessed with intelligent product design, and today’s release is the most fully realised example of that vision. Outfitted with a custom motor in the mid-sole that senses movement and weight, the shoe can adjust accordingly to varying weight and tension stimulus. There’s internal quad-axial material, which essentially molds to your foot shape, a cushlon foam midsole for maximum comfort, and power laces that lock in place at the push of a button. There’s also a downloadable app that allows you to save your favourite fits and control the colour of a mid-sole light, and, like your smartphone software, it will offer updates as new technological advancements are made. 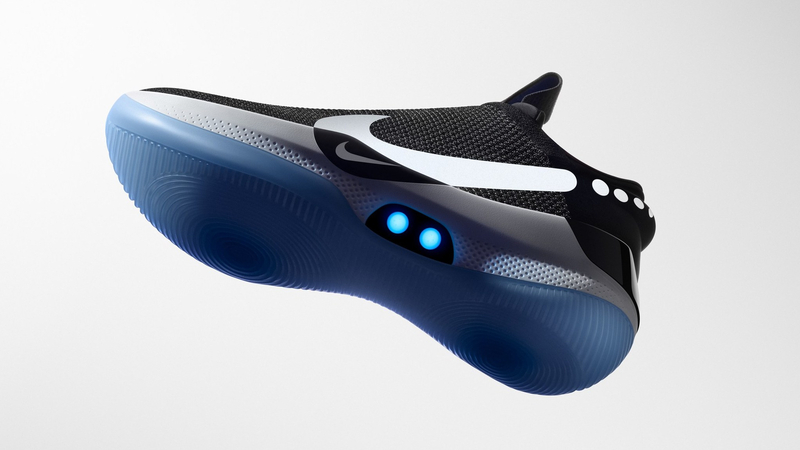 Best of all, they look great, with a sleek design that’s a mix of futuristic dreaming and real-world pragmatism. The craziest part? The shoes aren’t some far-out fantasy or just-for-show concept; they’re available for preorder for the relatively reasonable price of $490.